Torn apart by three funerals – Momma, Daddy and brother André – three sisters meet in their family’s home to share their memories and secrets in this heart-warming, redemptive musical. Eldest sister Olive, middle sister Marsha, and the youngest, Irene, have grown up in a staunchly military family and have come together to mourn André recently killed in Vietnam. Since the Bradshaw women are scattered across the country, Olive has decided to sell their childhood home sparking reflections of childhoods long past. Like all siblings, they squabble, but when they do, their hopes and dreams and personal impressions are revealed. From Olive’s description of losing her virginity in the basement to smooth-talking Cadillac Johnson to Irene’s childlike vision of her mother’s secret dances in the attic, there is plenty of humor between the pathos. Each woman brings to the table a different view of the father they feared and loved, and we see how their lives were formed. “Daddy believed in that uniform. He was a hard man born in a hard time, “ Olive explains to Irene whose anti-war stance is anathema to her sister. For Irene, a street-wise activist who dropped out of college to pursue her political leanings, finding her footing in a city torn apart by riots and looting, is her singular focus. 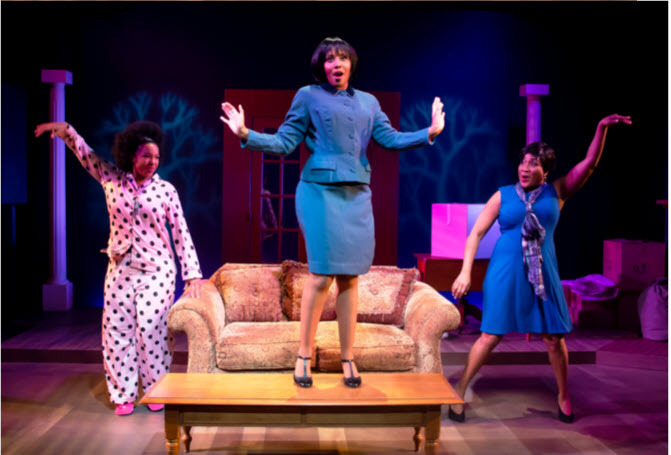 Written and directed by Thomas W. Jones III with music by William Hubbard, Three Sistahs is a big-hearted show, filled with passion and soulful spirit. 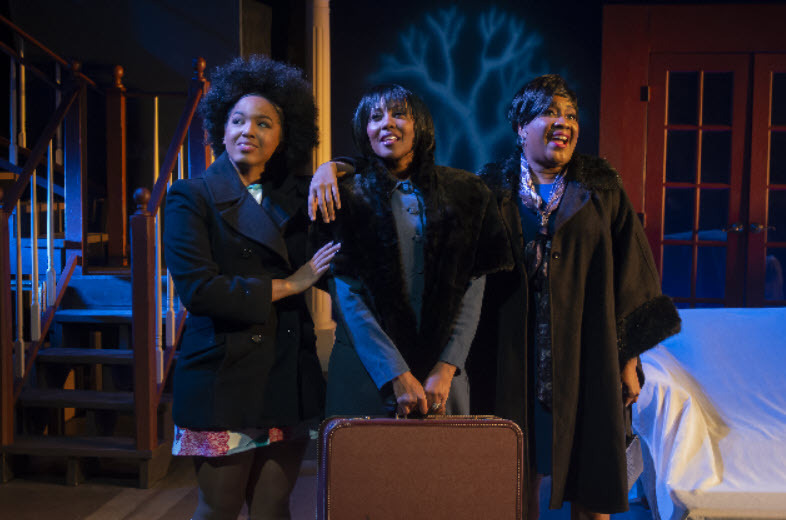 Based on 19th C Russian playwright Anton Chekhov’s “Three Sisters”, its twenty-one songs reflect a deep well of inspired musicality from Gospel to Motown to Rhythm & Blues sung by vocal royalty. This four-time MetroStage production has a new, more expansive staging that allows the performers to step into the audience for some of the numbers. The award-winning actress, Roz White, who reprises her role as Olive the spinster sister left behind to care for her ailing parents, is one of the most sought-after voices on the DC theater scene. She is a commanding and captivating performer who teaches master classes at Howard University and The Duke Ellington School of the Arts. Her rendition of the gospel favorite, “There’s a Leak in This Old Building”, paired with the electrifying harmonies of Reed and Watkins, will take you right up to the front pew. Ayana Reed has been on my radar since seeing her perform in four different productions and I am utterly blown away by her stage presence and the gorgeous vulnerable quality in her voice. Reed has performed at the Kennedy Center, Carnegie Hall and Lincoln Theatre, and was outstanding in MetroStage’s Blackberry Daze and Master Class, and also in Avant Bard’s The Gospel at Colonus. 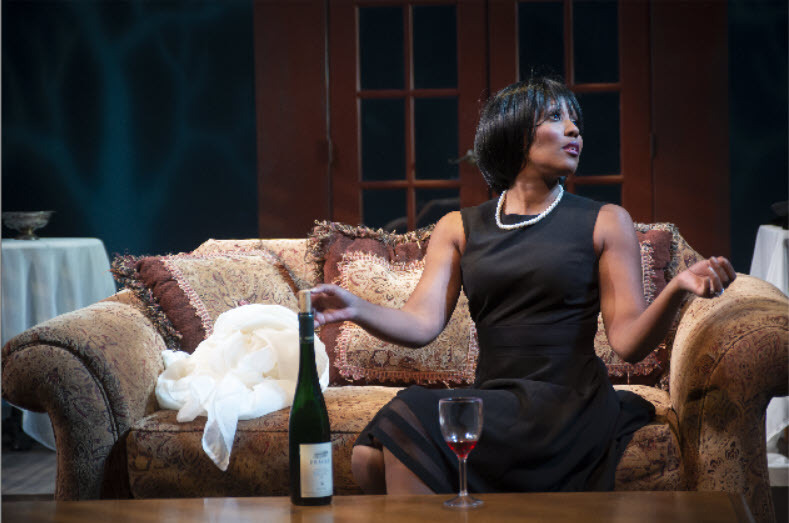 Last August we saw her play Marie in Marie and Rosetta at Mosaic Theatre in DC to Roz White’s Rosetta in a show that was a triumph for both performers. In Three Sistahs she shows the same intensity and vulnerability with her soulful delivery of “Letter One” and “In My Dreams”. 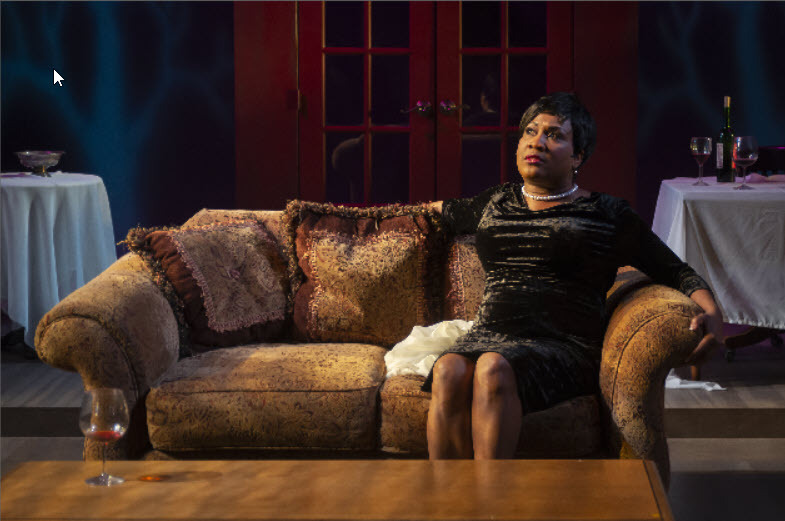 Kara-Tameka Watkins (Marsha) is another veteran of both local and national stages. Frequently seen in numerous major productions at Signature Theatre and Arena Stage, Watkins has that pure, pitch-perfect, spot-on voice that lends itself to these exquisite harmonies. Highly recommended. This cast is on fire. As Randy Newman once wrote, “You can leave your hat on,” though it may get blown off when these women raise the roof. Story by Janet Pryce; conducted by William Knowles on piano; Greg Holloway on drums; and Yusef Chisholm on bass. Set Design by Carl Gudenius, Costume Design Michael Sharp, Lighting Design by Alexander Keen, and Sound by William G. Wacker. Through February 24th at MetroStage 1201 North Royal Street, Alexandria, 22314. For tickets and information call 703 548-9044 or visit www.metrostage.org.